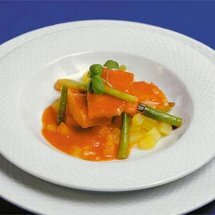 Clean and cut the stockfish into small pieces, the potatoes into small cubes and the leeks into thin slices. Sautee the leeks in butter for 5 minutes. Add the tomato purée, potatoes, stockfish and water.